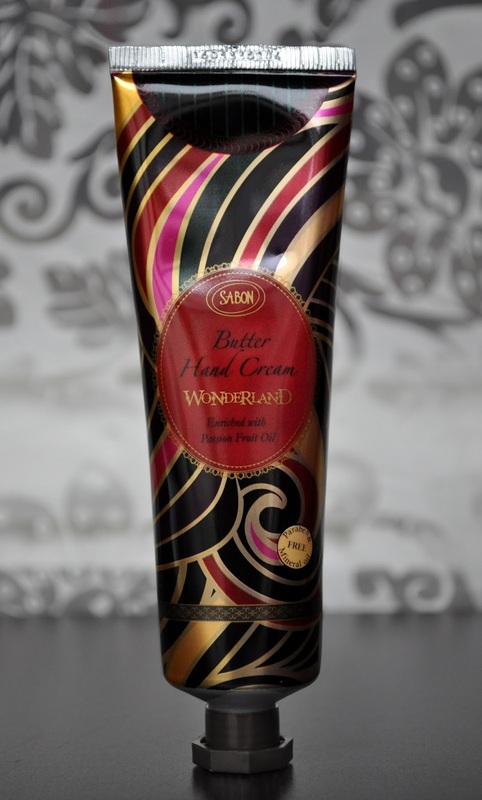 Thanks to my beloved sissy Jane (of Wondegondigo fame), I'm able to prolong my obsession of Sabon's Exploring Wonderland Collection. Thank you Jane, and I heart you! Yes, I got a bigger boat and purchased the 650ml size of the Wonderland Shower Oil. On a monthly basis, I never consecutively use the same body wash scent (I like to pair scents based on what I'm feeling that month). 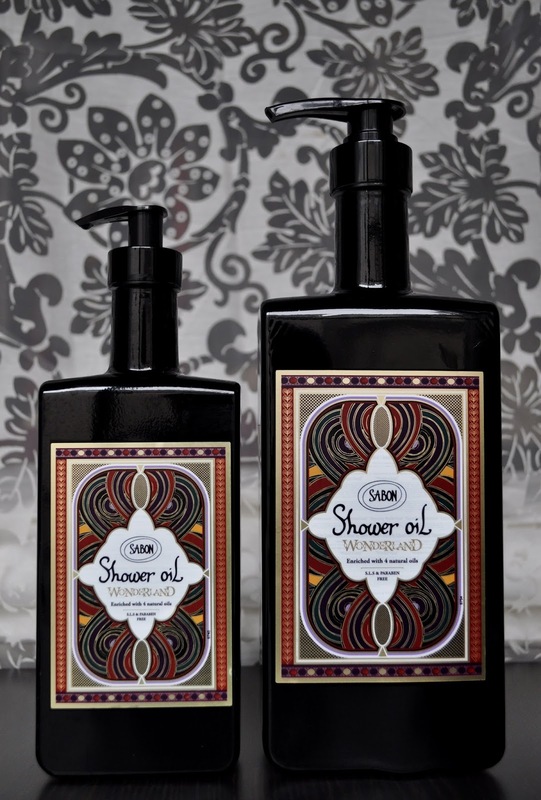 However, I'm in LOVE with the seductive notes of Bergamot, Mandarin, Musk, and notes of Rose and Violet of this collection, as well as how swimmingly it pairs with my winter hair products and perfume. February is just about over, and I'm almost at the half way mark of the bottle. Thus, the Wonderland Shower Oil will also be my body wash for March, and I'm perfectly content with that. 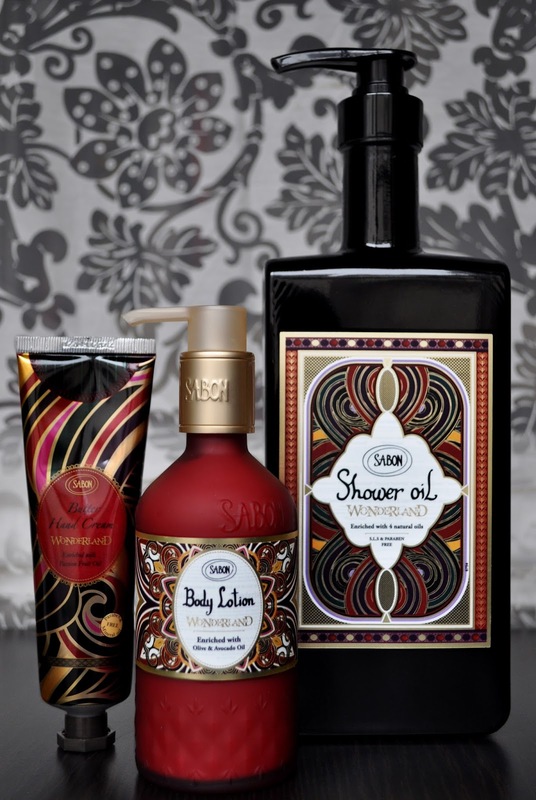 At the time the Exploring Wonderland Collection launched, I held off getting the body lotion and hand cream because I was in the middle of using some other products. Of course, when I was ready to purchase them, they were long gone (again, thank you Jane). 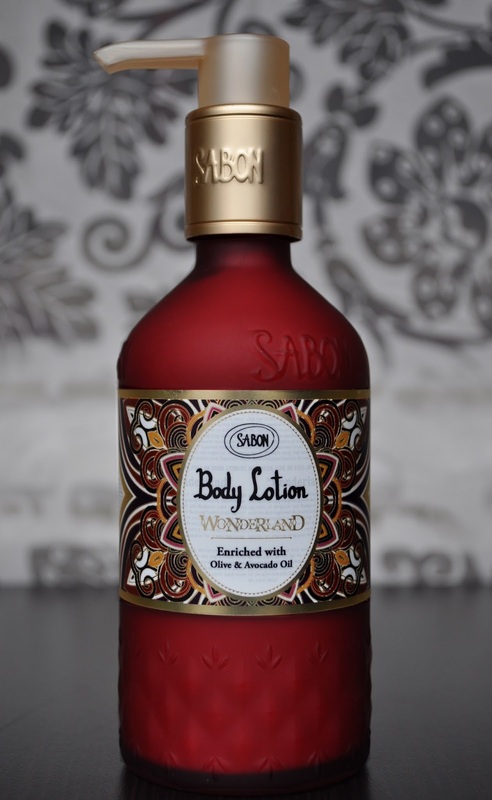 I adore the bohemian-esque etched detailing of the red frosted glass, and label print, of the body lotion; it truly adds to the pampering experience. Same amazing Wonderland scent, the body lotion is full of Omega 3,6,7,9, and Vitamins A+ E, and Formulated with Olive, Avocado, Borage, Wheat Germ Oils. My skin drinks up the body lotion, leaving it smooth and moisturized, without feeling sticky. It's a shame to keep this hand cream concealed in my bag, because the tube's pattern and colors are so beautiful, I want to display it. Not only does it keep my hands soft, and hydrated, the hand cream absorbs quickly leaving no greasy residue, and smells heavenly. I'm going to have to buy backups of all the products from the Exploring Wonderland collection because they're limited edition (I really need this line to be made perm), and I don't want to be without them next winter. Never heard of this brand but I'm intrigued! What's the scent like? Does the shower oil lather well? 💌💌💌💌💌 Sent with love! I need to get to a physical Sabon shop so I can go take a sniff too! I truly ❤️❤️❤️❤️ you dearest �� What have you been waiting for?? Btw, do you have the Sonia Rykiel eyeshadow palette in 05?